The history of Silesia Park has began in July 1951 with the conversion of this former mining site with its slag heaps. The 620 ha now include two zones of greenery: a quiet area with dense vegetation for a passive recreation neighbouring an area of mass culture, entertainment, sports and education for active recreation. 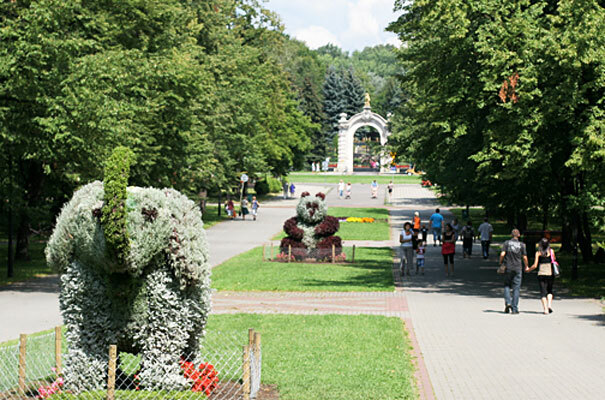 A main structure is the General Ziętek Promenade with most attractions located alongside and adorned with many flower beds, floral displays, trees and shrubs. Often in parallel a cable railway offers one of the rare opportunities to admire a park from a bird’s perspective. The Rosarium hosts 30.000 roses, including ramblers on specially designed constructions and forming spectacular pyramids of roses. The colourful perennial garden is almost entirely isolated from the park’s main alleys by a row of trees and shrubs. Scattered throughout the park are 14 ponds with nine fountains, naturally replenished with rainwater and a circulation of water along a specially designed system of canals and streams. The history of Silesia Park as an oasis of green incorporating many leisure facilities began in July 1951 with the conversion of this former mining site with its slag heaps. Situated within a triangle among Katowice, Chorzów and Siemianowice Śląskie, Poland’s most industrialized and populated region, more than 3 million people visit the park each year. The entire area, friendly for a wide diversity of activities and typical public park functions, was created by Prof. Władysław Niemirski (1914 – 2001), a well-known architect from Warsaw, who expertly combined new uses with the topography of the area. Niemirski’s design included two zones of greenery: a quiet area with dense vegetation intended for a passive recreation neighbouring an area of mass culture, entertainment and education intended for active recreation. Silesia Park covers an area of 620 hectares, including 250ha of forested areas and 100 ha of tended greens and parklands. Ponds, streams, numerous species of trees and shrubs as well as extensive greens are a refuge for wild animals and an appeal for nature and garden lovers while also offering a good rest for those who relax from outdoor activities or from a visit to other attractions located within Silesia Park, such as the Silesia Zoological Garden, the Silesia Planetarium, the Silesia Rope Park or the Silesia Amusement Park. The Rosarium was opened in 1968 along with the first International Rose Exhibition. Around 300 sorts of roses (10-15 plants from each sort) were planted and donated mostly by Polish and European growers. Seven hectares of land were transformed into honeycomb shaped flower-beds grouped by type and sort. Nearby, in the vicinity of several vast lawns, other flower-beds were located. Each of them contains 300 -1.500 roses of the same sort. Apart from the floribunda roses, the Rosarium hosts standard roses, miniature roses as well as the rambling plants living on specially designed metal constructions and forming spectacular pyramids of roses. The picturesque scenery of the Rosarium is completed by hedges of shrubs (barberry and ligustrum), picturesque birch trees and rare conifers (spruce, thuja and yews) and ponds with blooming lilies. The garden of perennials was established in 1961 mainly for economic reasons: it should help to reduce the cost of planting perennials elsewhere in the park, mainly on the numerous flower-beds. In the late 70-ties the park gardeners prepared a collection of almost 200 kinds of perennials which were displayed during the International Flower Exhibition. It became a place loved by visitors ever since thanks to the abundance of colours and shapes of the blooming flowers between April and August. The garden is almost entirely isolated from the park’s main alleys by a row of trees and shrubs. It is a picturesque scenery to sit and to enjoy peace and quiet. Even nowadays the garden makes the Silesia Park self-efficient on supplying the perennial plants. A main structure within the park is the General Ziętek Promenade, named after the former Silesia Region leader Jerzy Ziętek who, in addition to many volunteers, is considered as the father of the park. Not only are most attractions located alongside this avenue, but also it is adorned with many flower beds, floral displays, trees and shrubs. On 2.200 meters, and often in parallel to the main promenade, runs the Elka cable car. 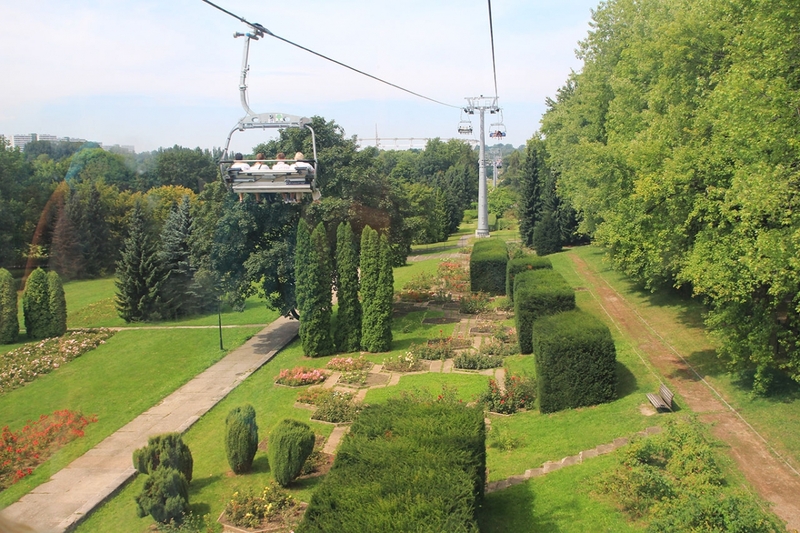 This cable railway, opened in 1968 and recently modernized, allows a comfortable return after a long stroll in the park and also one of the rare opportunities to admire a park from a bird’s perspective. Scattered throughout the park are 3 large and 11 smaller ponds, covering a total of 18 hectares. Nine fountains were added, including the main fountain in the very heart of the park. The ponds are 2 – 4 m deep and are naturally replenished with rainwater, water seepage and the gravitational circulation of water along a specially designed system of canals and streams. The ponds host a whole variety of flora and fauna, such as frogs, toads, the great diving beetle hunting even for tadpoles, wild birds and a big variety of fish, including silver Prussian carps. The two small ponds located near the Silesia Planetarium serve as a home to a large community of snails, including the great ramshorn snail. The dendrological pathway invites visitors to enjoy the beauty of some of the old trees in the park. Starting at park’s headquarters, this one kilometer walk includes 40 boards to learn more about these exceptional trees. Very likely you will meet some schoolchildren on their outdoor lessons to explore the biodiversity of the park’s flora and to respect nature. The collection includes the most popular trees in Poland and exotic species from other climate zones, including Liquidambar styraciflua, Tsuga Canadensis, Cercidiphyllum japonicum, Metasequoia glyptostroboides, Pinus cembra, Taxus baccata, Catalpa speciose, Pinus mugo Turra, Ginkgo biloba, Liriodendron tulipifera, Abies grandis, Magnolia tripetala. Among the many other attractions in the park, the Silesian Ethnographic Park is likely to attract those interested in gardens the most. Opened in 1975, and set on 20-hectares this open air museum of rural architecture and heritage is made up of mostly 19th and 20th century cottages and other wooden constructions mostly transferred from other places in Silesia. Gardens, reconstructed according to traditions, are essential features of some of the 102 buildings. Dogs: Dogs are allowed – leash and muzzle required + a free-run, fenced area for dogs close to the main entrance.